I was trying to add the "IQ Skills" from Pluralsight via my Stack Overflow profile but turns up that it is giving 404. 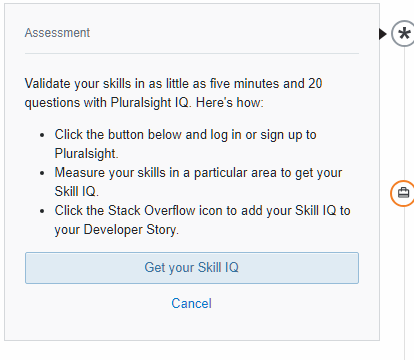 Click on "Find out with Pluralsight IQ - take a free assessment now" under the "Developer Story" tab. This will land you on a page with 404. Thanks for the report Muhammad. I just tested this link and I do end up on the correct page.